My father is working construction in Norway and he found skeletal remains under a house he's working on. I'm really curious to know what animal it could be, if anybody could help. The pictures aren't great, I know. I'm thinking maybe it's from a Bulldog, Bulldog mix, a raccoon, or something. I see weird things every day... It's called Normal. The Broad Autism Phenotype Test: Autistic/BAP. You scored 106 aloof, 129 rigid and 115 pragmatic. I also considered that, maybe a Persian because of the skull, but when I was googling I couldn't find a single picture of a cat skeleton/skull that looked like that. Maybe a Persian mix? How old is the house and where was the skeleton found? 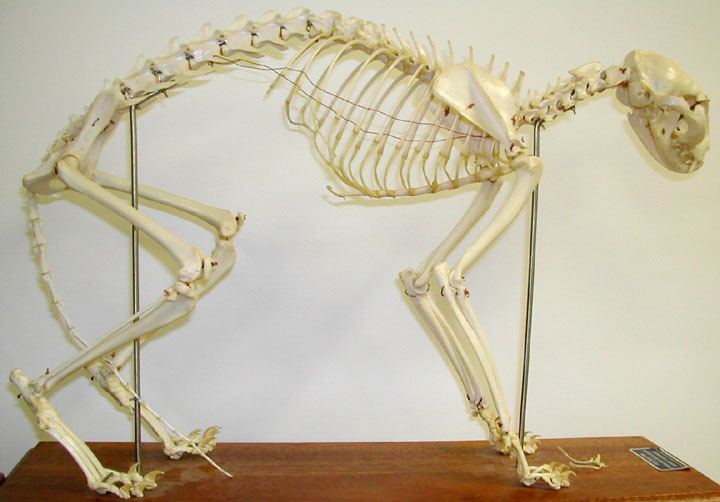 On second thought... After studying the picture of the whole skeleton better, I'm almost positive that it's a cat. I don't know how old the house is. I haven't spoken to my father for quite a while. We aren't even in the same country. I have him on facebook and he posted this a couple of hours ago asking for help with identifying what animal this could be. It triggered my curiosity. What size is it? That looks like a very strong lower jaw and very large canines. Really, I'm sure that animal could kill a child. Unless the size dictates otherwise, I'd say it looks like a fighting type dog (Staffordshire bull terrier, for example). Last edited by Mummy_of_Peanut on 02 Oct 2012, 1:49 pm, edited 1 time in total. I'm not sure what breed it would be, but it looks like a cat. If it's a cat I'd say it's a Siamese, Rex or Sphynx breed judging by the profile of the snout and head. I agree with MoP though, it's got large teeth for a cat. Looks like a kitty to me, but those canines are aweful large for a feline . I get several cats crawling under the porches to die. 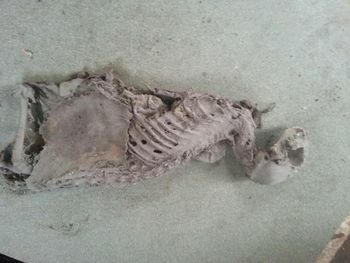 I'm working on cleaning and articulating a skeleton of a cat that has been under the porch before the previous owners of the house lived there. After articulating it, I want to make a powered exoskeleton for it. The jaw is all wrong, and the teeth too large to be a cat. The neck is too thick and connected to the head at a different angle than a cat's would be. If you found the skeletons legs, I would put money that they are too short and thick to be those of a cat. 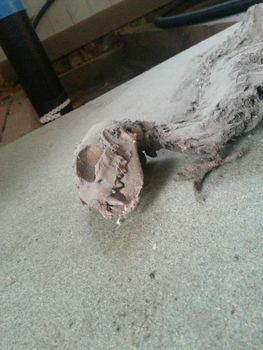 Looks like a cat to me,take it to a vet for a positive identification.I've seen dog skeletons but they were breeds with longer snouts.It could be a dog with a short snout.It does look like it could have torn a chunk out of something with those teeth. I don't think it's a cat. The teeth are too big, at least for a house cat. Perhaps a wild cat breed that lives in the area? Maybe a large rodent? A better picture of the skull would be helpful. It looks like a grey hound to me.